Morphine, morphine-6-glucuronide (M6G), morphine-3-glucuronide (M3G) and normorphine were analysed with high performance liquid chromatography in plasma and urine, collected over 72h after administration of single intravenous 5mg and oral 20mg doses of morphine to 7 healthy volunteers. 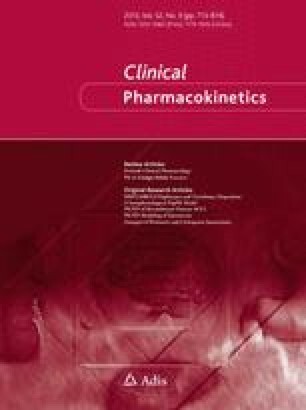 Systemic plasma clearance of morphine was on average 21.1 ± 3.4 ml/min/kg (1.27 ± 0.20 L/h/kg), volume of distribution was 2.9 ± 0.8 L/kg and oral bioavailability was 29.2 ± 7.2%. Clearance of morphine to form M3G and M6G comprised 57.3% and 10.4%, respectively, and renal clearance comprised 10.9% of total systemic plasma clearance; hence, more than one-fifth of a dose (20.8%) remained as unidentified residual clearance. On the basis of the area under the plasma concentration-time curves determined after oral and intravenous administration, the ratios of M6G: morphine were 3.6 ± 1.2 and 0.7 ± 0.3, respectively. The corresponding figures for M3G: morphine were 29.9 ± 6.8 and 7.7 ± 1.4. Differences in metabolic ratios between the parenteral and oral routes could be attributed solely to differences in morphine concentrations as evidenced both by plasma concentrations and amounts excreted in urine. An oral: parenteral potency ratio of 1: 3 may, thus, be due to differences in circulating amounts of morphine since the proportions of an administered dose found as M6G and M3G after administration by both routes were equal. A major finding was a slowly declining terminal phase of morphine and metabolites that was evident both in plasma and in urinary excretion versus time curves, where the half-lives of morphine, M3G and M6G were 15.1 ± 6.5h, 11.2 ± 2.7h and 12.9 ± 4.5h, respectively. The terminal half-life of normorphine was 23.9 ± 10.1 h after oral administration. Comparison of oral with intravenous excretion curves showed that a greater part of morphine and metabolites were excreted during the slowly declining phase after the oral dose than the intravenous dose, which is highly suggestive of enterohepatic cycling. The renal clearance of M6G and morphine was seen to exceed creatinine clearance, possibly due to an active secretion process.